Every May I go through an identity crisis. It’s true. I do a lot of self-reflecting during that time as the students return home for the summer. I ask myself whether or not I am still the right person for the job. I ask myself if God is leading me in a different direction in ministry. I reflect back on the year and try and learn from my mistakes and celebrate all that God has done. This May was no different. I want to tell you that something AMAZING! happened. I want to tell you that God spoke clearly, that God filled me with zeal and energy and hope and thanksgiving and peace and strength. I want to tell you that God sparked a fire in me that I haven’t felt since I first gave my life to Christ when I was in college. I want to tell you all of that because...IT’S TRUE! God has worked in my life during the past summer and beyond to reaffirm my place in Wesley. God has done that through an exceptionally gifted group of students, through speakers at the New Room conference, and through prayer and discernment. Guys, if you are reading this I want to let you know that I believe Wesley is thriving. Our student leaders are passionate, humble, willing to learn and serve, and are constantly encouraging each other. We are celebrating baptisms, we are seeing new Christians make decisions to follow Jesus, we are witnessing a beautiful community form, and we are having SO MUCH FUN doing it all. I want to share two powerful stories that show how God is moving and using our college students to change the world. Just recently, the Lord has placed a calling at Wesley to help out a poor neighborhood in our community. So another student and I went door to door asking people what kind of help they need. We knocked on one door and a man came out crying. He shared with us that he turned on his gas in his trailer home to commit suicide. He was crying out to God and asking God why he left him because of this terrible situation. It was at that moment that we knocked on his door. He came out in tears and we prayed with him. Today he is back working, filled with hope, and we are staying in touch with him to make sure he knows of God’s love. A couple of semesters ago we met a college sophomore who found us online. She is spunky, outgoing, kind, and has been a big part of our ministry. She is one of our biggest evangelists, constantly inviting people to our home churches and our Tuesday night services. After a sermon I preached on the power of sharing your testimony, she shared hers online. Little did many of us know that before she came to Wesley she was hospitalized due to alcohol poisoning. She was in a very dark place and began to search for a place to connect and transform her life. You can find her today holding doors open on a Tuesday night inviting people to her new community. Our students have done a great job supporting her, loving her, and teaching her all about the Christian faith! 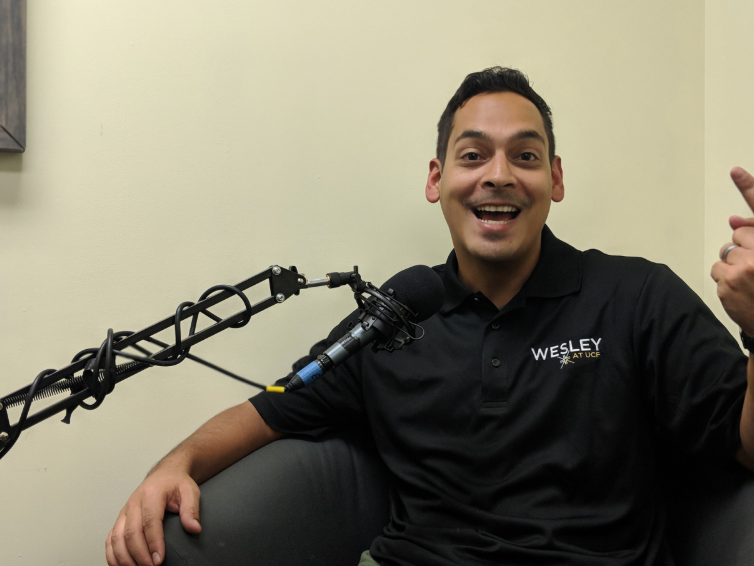 As you scroll through this newsletter you will read stories of our alumni, our current programs, and the many other ways God is using Wesley at UCF. Please consider supporting us financially so we can reach our big goals and continue to be a place where college students grow in their faith! And most importantly please pray for us as we continue to shine God’s light in Florida’s largest university.